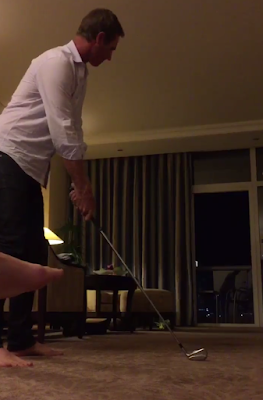 Home Video Watch: Nicolas Colsaerts Smashes Ball Out Hotel Room Window. Then Gets Jumped By Melissa Reid! Watch: Nicolas Colsaerts Smashes Ball Out Hotel Room Window. Then Gets Jumped By Melissa Reid! Thanks to reader Paul for sending in this gem via @KevinCraggs on Twitter. I'm assuming the hotel room was facing the beach or desert or somewhere where no innocent passer by was going to get killed by a projectile. Fair play to Nicolas Colsaerts for attempting this. Safe to say many of us had the opportunity but never had the courage to try! Nicolas Colsaerts nails one out the window of a hotel room. Then gets jumped on by Mel Reid! Via @KevinCraggs twitter.